It has been estimated that 1 in 5 Americans will develop skin cancer in their lifetime—a startling fact that is prompting dermatologists that provide skin care in Provo, UT to recommend annual check ups and monthly self-examinations for their patients. 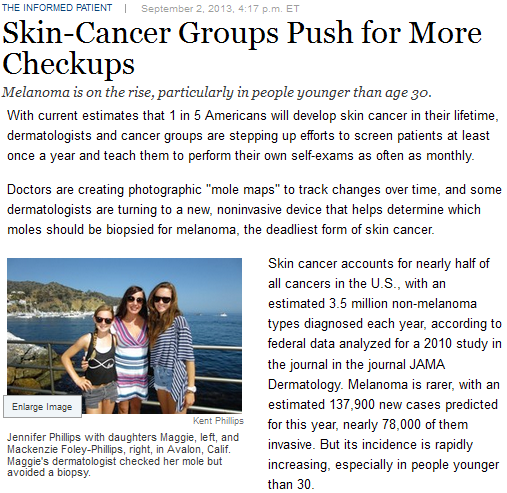 According to Laura Landro of The Wall Street Journal, federal data indicates higher incidences of melanoma, the most lethal yet rarest form of skin cancer. Many cases of melanoma have been diagnosed in people under 30 years of age. Skin cancer is particularly prevalent in states like Utah. A survey conducted by the Centers for Disease Control and Prevention in 2012 tagged the Beehive State as the “leader” in skin cancer deaths nationwide, with 90 to 100 fatalities every year. Nearly 50 percent of white adult residents in Utah have had at least one sunburn, which is a precursor for skin cancer cell growth. One way to identify skin cancer in its earliest stages is to undergo screenings at the hands of an experienced dermatologist like Dr. Richard Stone, M.D of Stone Dermatology. Licensed and experienced dermatologists have a host of methods and equipment that can determine the skin ailment. The Wall Street Journal article went on to list potential warning signs of skin cancer, such as open sores that do not heal quickly and skin growths that oddly change in pattern. Those who have been diagnosed with skin cancer are asked to follow certain steps to prevent their condition from worsening. The dermatologist may recommend that you take medication and liberally apply sunscreen across all regions of your body. Moreover, Landro said more cases of skin cancer are being attributed to tanning bed use; hence, this practice must be avoided at all costs. Dermatologists that specialize in skin care in Provo, like Erik Zenger, P.A of Stone Dermatology, have removal procedures for unwanted skin formations, like moles. Moles aren’t just aesthetic bummers when you’re trying to achieve a flawless appearance, as some moles can indicate early-stage melanoma. The article cited the case of a New York businesswoman whose dermatologist did a biopsy on a mole on her leg, which turned out to be early-stage melanoma. Most forms of skin cancer have the appropriate treatments, but early detection via medical checkups and self-examinations will ensure that such diseases are detected in their early stages. If you see unusual spots on your body, it is best to have them evaluated by a dermatologist to ensure your chances of survival.